1. Mrs. Meyer's Clean Day Soy Candle will make your entire apartment smell as good as a fresh pile of laundry, no matter what your hamper looks like. I have this little candle and man does it pack a punch. I once walked into my apartment when it was lit and assumed someone cleaned the entire place while I was gone (sadly, no one actually did). It smells very fresh without being overbearing. 2. Pet House Candle completely eliminates odors from your beloved — but stinky — furry friends, leaving you with a refreshing smell like bamboo watermint or evergreen forest. Read our review of this candle here. 3. 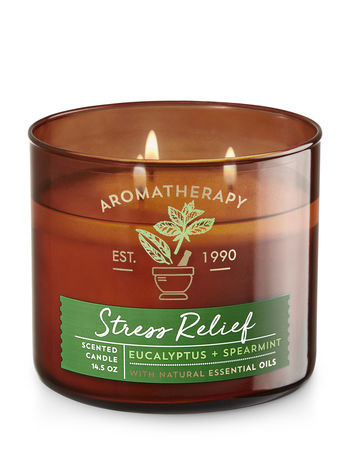 Bath & Body Works' Aromatherapy Stress Relief Candle has three wicks, allowing it will burn evenly and last a long time, so you can really depend on it to relax you when things get hectic. 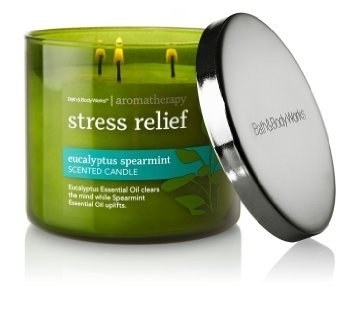 It's made with highly concentrated eucalyptus and spearmint essential oils to create a soothing and refreshing smell. The color of the glass varies. 4. Cult-favorite Capri Blue Volcano smells just like an Anthropologie store, so you can enjoy the smell without being tempted to buy anything (except 100 more of these candles). This little tin burns for 35–40 hours and smells like tropical fruits, sugared citrus, and stylish clothing. Promising review: "This candle is heavenly. It puts me in a better mood immediately and I can pretend I live in an Anthropologie store. The tin is attractive and does not get too hot until it's at the end of the wick so I put it on a stone coaster or trivet toward the end of its life. Great gift!" —Caroline S.
5. The Nest Fragrance bamboo candle proves that pandas have great taste, because bamboo smells amazing. 6. Wax & Wick's scented soy candle looks like it would be right at home in a Brooklyn loft, or better yet, *your* home! It has a double wood wick and gives off a cozy glow for up to 60 hours. 7. Anjour's four pack gift set comes with long burning candles in smells like pear and freesia, blackberry and bay, orange, and peppermint. The sampler lets you try out different candle fragrances so you know what scent you want to invest in when you buy a larger size. 8. La Jolie Muse vanilla coconut candle smells like a wonderful sugary treat — you don't even have to bake anything. 9. Pyropets start out endearing and take a macabre turn once you light them up. There is a metal skeleton in the middle of your candle that emerges as the candle wax melts. Be sure to put this on a plate so you don't make a mess. 10. La Jolie Muse's floral scented candles make your home smell like a field of flowers, even if you just cooked fish with a lot of garlic in the other room. You get a pack of two soy wax candles: lavender and lilac, and jasmine. Each burns for about 40-55 hours. 11. Paddywax's Urban Collection looks way more than chic than any candle has any right to be. These 12-ounce soy candles are poured into concrete pots with painted geometric accents. It's one part candle and one part home decor. You can even reuse the pot as a planter once the candle is done. 12. Jonathan Adler's Pop Candle makes every candle lighting feel like a celebration. 13. DW Home's tobacco pipe candle takes inspiration from all the pipe-smoking grandparents we grew up with. My grandpa smoked Pall Malls, but somehow I don't think that would make for a good candle fragrance. 14. Gerrard Larriett's candles deodorize and relieve stress so you can take a breather after chasing your mud-covered dog around the house. 15. Rewined's pinot noir candle is housed in a halved wine bottle to really sell the vineyard vibe. Become a sommelier of candles with this kitschy candle. The soy wax candle has accents of fig, earth tones, leather, cranberry, and violet. 16. Decorative cactus candles make it look like you finally learned how to keep a plant alive. Just make a *point* not to light them in front of anyone you're trying to impress with your green thumb skills. 17. Chesapeake Bay's Mind and Body Candle Collection uses essential oils to create relaxing smells inspired by Maryland's shoreline. 18. Highland Bluff's Buttery Brew is not the same as drinking a real pint of butterbeer, but it's a decent compromise. This Harry Potter-inspired candle smells like buttered rum, spice, and vanilla. It will make your home smell magical, but sadly, you can't drink it. 19. 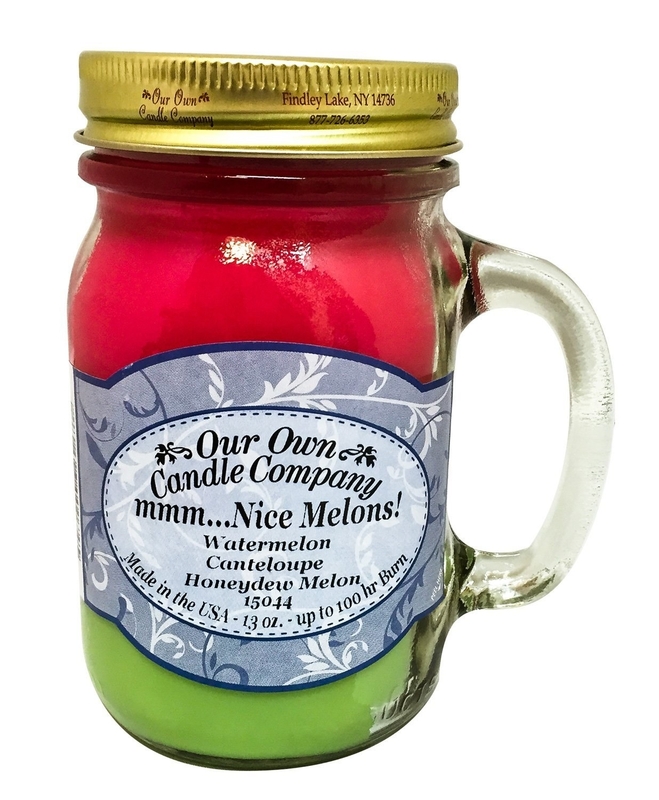 Our Own Candle Company's watermelon scent delivers a good pun, but the smell of this delectable candle is no joke. And by good, I mean super immature! 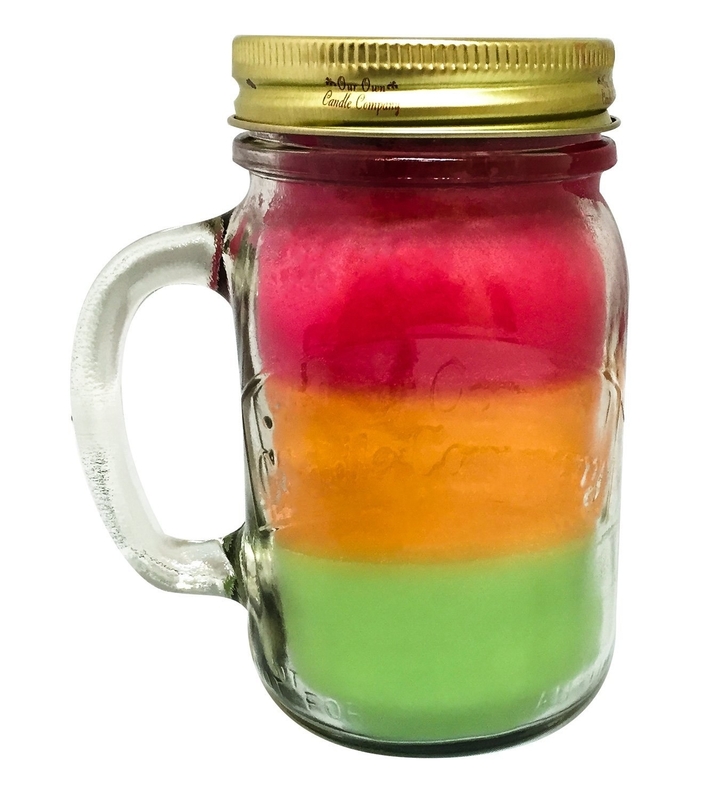 This 13-ounce jar starts with watermelon, then cantaloupe, and finally honeydew.